Cathedral Peak is one of the most aesthetic routes in Tuolumne. The climb consists of five pitches of easy and moderate crack and face climbing on perfect rock. The first few pitches are on low angle terrain that gradually steepens and becomes more difficult. Because of its quality and moderate grade, this is one of the most crowded routes in Yosemite. Luckily there are a number of variations if you need to pass a party. Which SuperTopo guidebooks include a topo for Southeast Buttress? Wilts and Spencer Austin often climbed in the Valley on weekends in the early 1940s, and they were almost the only people in the Valley, with climbers and tourists alike involved in the war effort. Super climbers, they were the first to free the Regular Route on the Higher Cathedral Spire (1944). Later (1946 and 1947) they made valiant attempts on the Arrow Chimney, only to lose the route to John Salathé and Ax Nelson. 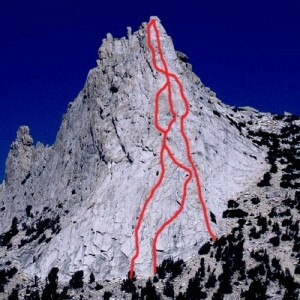 Virtually nothing is known about the history of the Wilts/Austin route on the Southeast Buttress of Cathedral Peak, even the year of the ascent. They never mentioned the climb in any major publication and, being modest men, never bragged about their soon-to-be classic route. The only clue—seven trivial words—appears in a mimeographed Sierra Club newsletter dated September 9, 1943, which states that in late July the pair “climbed the south side of Cathedral Peak.” This could well have been the route we are talking about. Whatever the year, it seems safe to say that they got the idea for their route by looking at that amazing profile of the buttress seen from many places along the Tioga Road east of the Meadows. It would be hard for a climber to scope that view and not want to be up there. Why no one had done the buttress in the 1930s is unclear, except that the pioneers back then usually sought out unclimbed summits rather than put up new routes.